Is there a moment in The Simpsons as heartbreaking as the scene in “I Love Lisa” where Ralph boldly proclaims his love for Lisa Simpson on Krusty’s 29th Anniversary Special and Lisa screams at him that she does not reciprocate his feelings and only gave him a Valentine out of pity? For that matter, is there a moment in the whole of pop culture as heartbreaking as that unforgettable moment? Yes, “I Love Lisa” holds a special place in a lot of people’s hearts as one of the sweetest and most poignant episodes in the show’s run. According to the episode's audio commentary, showrunner Al Jean was so touched by the episode—which was inspired by a Valentine he received as a boy reading “I Choo-Choo-Choose You” followed by “I really do” that made him wonder if it was the typically generic Hallmark sentiment or an genuine expression of romantic interest—that he had “I Choo-Choo-Choose You” inscribed on his wedding ring. Hell, I continue to be so touched by the episode that upon learning that I now vaguely regret not having “I Choo-Choo-Choose You” inscribed on my own wedding ring. 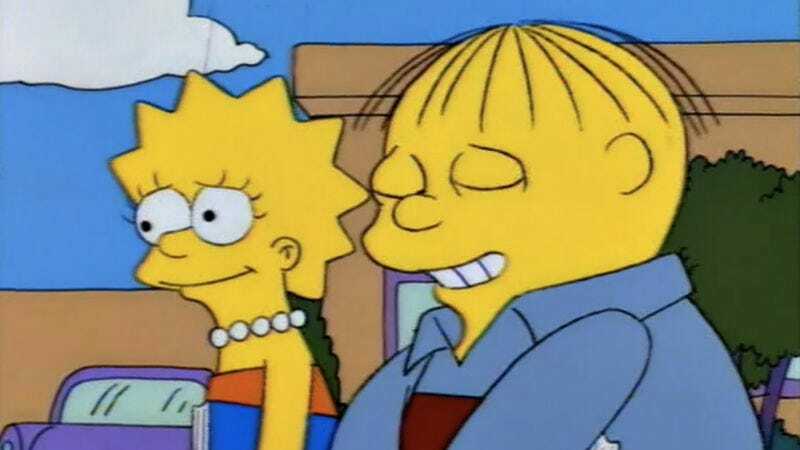 Ralph Wiggum is generally employed as a bottomless fount of glorious non sequiturs, but in “I Love Lisa” he stands in for every oblivious chump who ever deluded himself into thinking that with persistence, determination, and a pure heart he can win the girl of his dreams. So while Ralph generally seems to inhabit a different, more glorious and joyful universe than everyone else here his yearning and heartbreak are eminently relateable. Ralph sometimes appears to be a magically demented sprite who has assumed the form of a boy, but he’s never been more poignantly, nakedly, movingly human than he is here. Unconvinced, Bill presses on, accusing Marty of playing the wrong record, to which Marty can only reply with a defensive, wounded, “Why are you doing this to me?” Whether the parties involved are radio personalities, school children or a married couple, relationships can be difficult and complicated, especially when the pressure of Valentine’s Day is factored into the equation. Valentine’s Day means different things for different people. For Homer, it means forking over a hundred dollars for a dusty box of chocolates at the Kwik-E-Mart after characteristically forgetting the holiday yet again. For Ned, it’s another opportunity to prove his love for his wife. Most germane to the episode, for Lisa, Valentine’s Day means being the only person in her entire class to give Ralph a Valentine after noticing him looking crestfallen and alone at his desk. For Ralph, any encouragement is too much. When Lisa gives Ralph a valentine bearing that locomotive pun that so affected The Simpsons’ showrunner, Ralph misinterprets the gesture as a genuine display of romantic interest rather than a gesture of pity from a thoughtful young geek to a friendless goober. After school, he continues to test the boundaries of Lisa’s tolerance for him by asking to walk her home, then desperately trying to fill the dead air with open questions like, “Do you like stuff?” How do you answer a question like that? You don’t. You just smile and nod and hope that the excruciating awkwardness ends as quickly as possible. The sequence where Ralph walks Lisa home and tries to make a love connection represents a masterpiece of the comedy of discomfort. Lisa tries to let Ralph down easy but Ralph has an ace in his sleeve: He knows just how badly Lisa, and also the rest of the entire universe, wants to go to the taping of Krusty’s big anniversary special. As such, he offers her a Faustian bargain: She can go to the taping of the millennia (at least until Krusty’s 30th TV anniversary rolls around) as long as she goes with Ralph. Ralph’s agonizingly public declaration of undying love enrages Lisa, who, in a fit of fury, unleashes on him for all the world to see, letting him know in no uncertain terms that she only gave him the valentine out of pity. 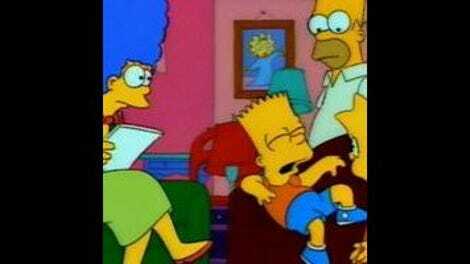 As Bart impishly observes while watching and rewatching the scene on television, if you watch it in slow motion, “You can actually pinpoint the second when his heart rips in half.” He’s not kidding. Ralph is understandably devastated. It’s hard not to feel his pain. The world is cruel to poor Ralph but redemption lies around the corner. With a little help from his dad and his underlings at the police department, Ralph has been cast in a school production about presidents as George Washington opposite Lisa’s Martha Washington. In a wildly implausible yet nevertheless satisfying and funny development, Ralph morphs instantly from an idiot man-child into an actor of rare power and depth in a stirring climactic performance that affords the character a rare moment of dignity and triumph in a life generally devoid of either. Ralph even has a nice moment at the end where he reconciles himself to being Lisa’s friend and they happily ride the swingset together while “Monster Mash” plays romantically in the background, a wonderful callback and the perfect ending to a perfect episode. I enjoyed all the archival clips from Krusty’s decades in the business, particularly the peeing monkey. The monkey. The pee. It works on so many levels! Bart is clearly willing to go to M. Butterfly lengths to go the Krusty anniversary show. Thank goodness it doesn’t come to that. The song the mediocre presidents sing is one of my favorite overlooked ditties on the show, with lyrics like, “We are the mediocre presidents/You won’t find our faces on dollars or on cents!/There’s Taylor/There’s Tyler/There’s Filmore and there’s Hayes/There’s William Henry Harrison/I died in 30 days!/We are the adequate, forgettable/occasionally regrettable caretaker presidents of the U.S.A!” I also enjoy the running joke about Skinner's desperate efforts to unload hopelessly watered-down orange drink. Next up is “Duffless.” If memory serves, that’s a good one.